The alluring cuteness of Dachshunds and Corgis most likely stems from their disproportionate body composition: long bodies, tiny legs! While absolutely adorable, their layout does not come without added risks. Their tiny spines carry a lot of joint stress that predisposes them to a condition called intervertebral disc disease (IVDD). This disease is common and can result in complete hind end paralysis for life if not recognized and treated quickly. So let’s examine the common signs, why it happens, and what to do if you suspect this disease in your furry friend. The vertebrae of the spine have small discs between each segment that serve as shock absorbers and keep the vertebrae from suffering trauma when your dog’s body is active. These discs prevent your dog’s spine from being damaged doing simple things like going up stairs or playing catch, but over time these discs undergo degeneration. This results in the hardening of the disc, which ultimately leads to loss of function. When this happens, the disc is at risk of extruding or moving out of its normal position when a compressive force is applied. This is because the normal squishy shock absorber is now a spring-loaded projectile. In small breed dogs, this compacted disc material is extruded upwards when a force is applied to it, and as a result, the spinal cord that lives above it becomes compressed. If this sounds like a bad thing, you’re right! Depending on where this occurs in the spinal cord, signals from the brain may not be able to be transmitted effectively, which can lead to your dog not being able to walk appropriately, control their bladder, and may also cause them a lot of pain. This process can happen in a matter of minutes and will need medical attention fast. Okay, so I have a large-breed dog. I am safe, right? Unfortunately, they get their own type of IVDD. Breeds like German Shepherds, Labradors, Dobermans, and really any larger dog that is active can have this occur. The good news is that these types of dogs get a protrusion of the disc instead of an extrusion that comes on slow and can usually be medically managed. All right, it’s happened! Now how do I treat it? As you can imagine, nerves are very delicate and require fast action to ensure appropriate recovery. 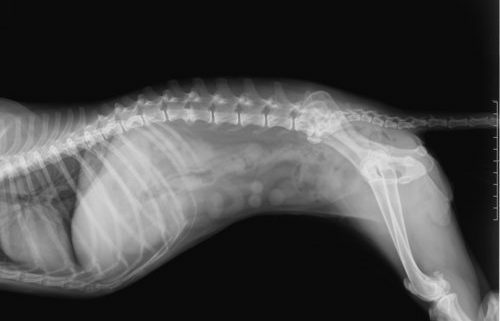 IVDD can range from a small amount of spinal pain to complete hind limb paralysis, and it can progress to an irreversible disease in a matter of hours depending on severity. If your dog is lucky, a small amount of back pain that is often recognizable by your dog crying out going up stairs, reluctance to jump may be as far as it progresses. In this case, strict cage rest and some anti-inflammatory medications can have your pooch back to normal in no time. If, however, your dog is one that has problems placing their feet, cannot stand up, and does not seem to have voluntary bladder control, you may be looking at a surgery to fix your pet. During this surgery, the veterinarian will go into the spine and remove the disc material compressing the spinal cord. This is a costly surgery, and only certain veterinarians will be able to preform it. Before doing so, the exact location of the disc rupture will need to be determined by using X-rays, CT, or potentially an MRI. Once performed, the recovery period is variable with some dogs walking in days, while some may need rehabilitation and may not walk normally for months. Recovery rate is about 70 to 100 percent with dogs that don’t have complete loss of deep pain in their hind limbs before the surgery. If this procedure is not performed quickly, the nerves will lose blood supply and the situation may be irreparable. So if you suspect this is happening to your pet, act fast. So what signs can you look for, and how can you prevent this? Dogs usually show a wobbly hind end, reluctance to climb stairs, or may cry out in pain with early onset of the disease. With more progressive disease, dogs will be unable to rise or stand on their own and will be incapable of placing their feet, especially in the hind limbs. Preventing high-impact activity such as jumping, quick turns, or fast stops can limit stress put on the spine. Ultimately though, this can happen to any breed at any time, so knowing what to look for and when to seek veterinary care can save your pet’s life. Well, it’s like this. I’m not afraid of dogs; if I were, I couldn’t do my job. I do, however, have a certain respect for what their teeth can do. It’s born of seeing many a dog bite injury in my career: many of them on my patients, some on my co-workers, and a few on myself. Our furry best friends come with teeth that were designed to cut and crush flesh, and they’re pretty good at it. Big dogs of course can be more dangerous, but size doesn’t always matter. Almost any dog can, if motivated, give me an injury that will put me out of work for months. What are the odds that any particular dog will bite? Unfortunately, that dog’s owner isn’t always the best person to make that prediction. Dogs that are angels at home with their people sometimes make bad choices when they’re in a strange place, surrounded by strangers, feeling threatened, or cornered or in pain. Some dogs will even bite their owners when they’re at the vet’s office. In this game, there are no bonus points for doing things the reckless way so I prefer to err on the side of safety. Placing a muzzle on an uncooperative dog can actually make the process of providing veterinary care easier on the patient. It isn’t immediately obvious that this would be true, but it is true. Some dogs, when muzzled, just freeze. You have seen this phenomenon in action if you have ever seen a rowdy puppy annoying an older dog until the adult has to give the pup a correction; they do this by taking hold of the pup’s muzzle to make it stop misbehaving. In the same way, some dogs, when muzzled, seem to get the message that it’s time to stop snapping and struggling. That means I can do my job quickly and thoroughly rather than having a prolonged wrestling match that’s far more upsetting to the patient than whatever it was I was trying to do in the first place. Of course, the process works best if the dog is muzzle-trained, and I encourage every dog owner to do so. But even or especially in patients that won’t give up resisting, a muzzle ultimately reduces the risk of anyone getting bitten. And while I selfishly want to keep my skin intact, I also want to avoid bites for the dog’s and the owner’s sake. Wisconsin state law is quite strict on the subject of dog bites. Any medical care provider who treats a person that was bitten by a dog is legally required to report the bite to the authorities, and the dog is then subject to rabies quarantine. This is expensive for the dog’s owner and means extra visits to the veterinarian’s office for the dog that didn’t enjoy going in the first place. If the dog dies or is euthanized for any reason before the end of the quarantine period, its body must be tested for rabies, a process that can also be expensive for the owner. Of course muzzles aren’t the only tool I have to keep teeth off skin. I rely on my expert staff to distract and safely restrain pets, and I use all my training and experience to make veterinary care as painless and reassuring as possible for the patients. But there are times when a muzzle is the right choice, and then I don’t hesitate. It’s for everybody’s protection.